I love chips. I love popcorn with butter. I love crunchy things that are bad for my health. Wait, scratch that, because I now also LOVE roasted chickpeas and they’re good for me! OLE! 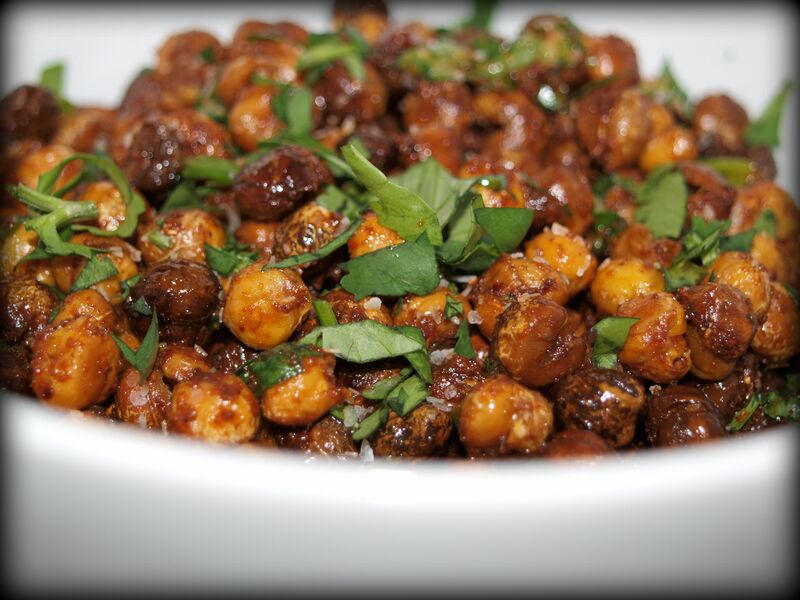 There’s lots of ways you can flavour your roasted chickpeas and I’ll add more in the future. For now though, try this version and tell me if you don’t think your chips look a little dull afterwards. Preheat oven to 400F. Line a baking sheet with aluminum foil and spray with cooking spray. Spread chickpeas out in a single layer over the foil. Pleasantville note: Remember the drier they are when you put them in the oven the better. Bake chickpeas for 40 minutes or so, tossing chickpeas every 15 minutes or so. Near end of roasting time, check for doneness by removing a couple and letting them cool for a minute. They are done if they are crunchy all the way through. If still soft they need a few more minutes. While chickpeas are roasting prepare spice mixture in a large bowl, whisking to combine. When chickpeas are done, remove from oven and let cool for a minute or two, before tossing them in bowl with spice mixture to cover well. Eat immediately or store in an airtight container (once cooled completely) to eat later. Love this!!!!!! Gonna make this weekend. You know you’re supplying my family with about 78% of our recipes this month, right? TY!!! Any chance you have the nutritional info for the recipe? Wow, this looks so good!! I think I’ll try it this weekend 🙂 Thanks for sharing!! Let me know what you think Lesley!